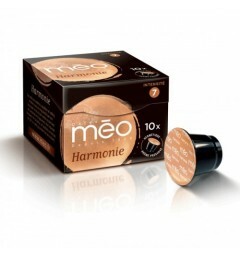 Méo capsules of 100% compostable organic coffee from fair trade compatible with Nespresso ® coffee makers. 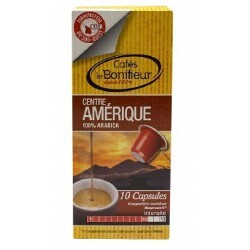 These 100% African Arabica blending capsules from Africa and Latin America profit from a Dark roasting, ie the baking of the coffee is pushed. 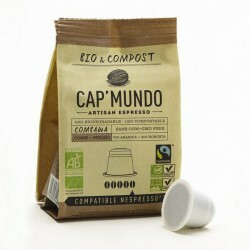 This roasting is very popular in the Mediterranean Ristretto or Espresso after lunch. You can enjoy these organic capsules all day long. Goût moins torréfié que j'aurais pensé mais bon. Très agréable, le plus puissant mais sans amertume désagréable. 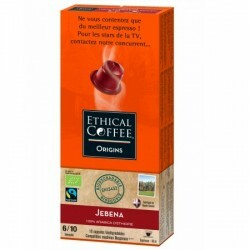 Organic Fairtrade by Méo, Nespresso® compatible coffee capsules.